"Godzilla" surpassed expectations in theaters by grossing a whopping $93 million opening weekend, which resulted in Warner Bros immediately announcing a sequel. The studio just revealed that "Godzilla" director Gareth Edwards will return for the sequel, but will first direct another film. It now turns out that the other film is the first "Star Wars" spin-offs, which is set to hit theaters on December 16th, 2016. "Ever since I saw 'Star Wars' I knew exactly what I wanted to do for the rest of my life - join the Rebel Alliance! I could not be more excited and honored to go on this mission with Lucasfilm," said Edwards. He gonna have his hands full. Doesn't sound too god for quality sequels. 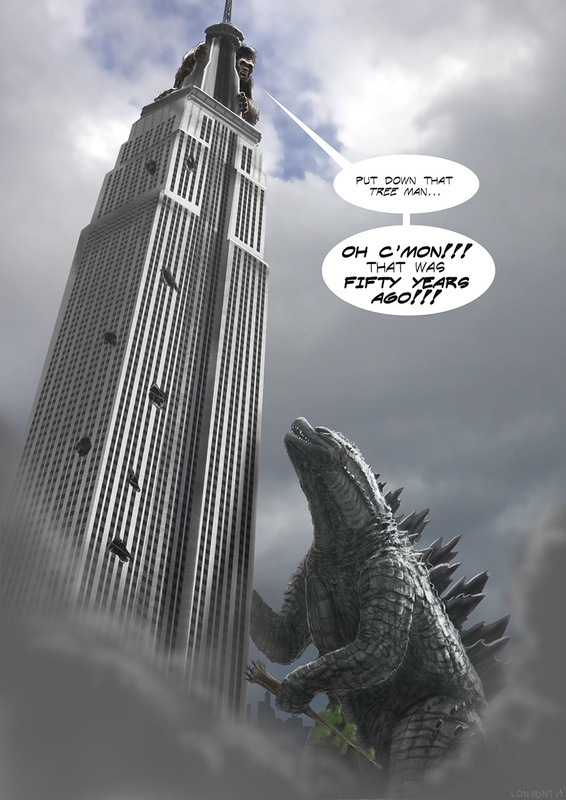 Anyway, just found this pic and might be a good idea for the next Godzilla sequel. f*ck Godzilla, f*ck that movie. I went with five people and we all agreed it was a crappy reboot. It had some good aspects, but all in all it's no more then a 6/10. I was surprised at that box office though! That's a f*ck ton of money for only a week or so release. Ever since I saw 'Star Wars' I knew exactly what I wanted to do for the rest of my life..
GODZILLA might've been mediocre, but I thought Edwards direction was pretty good. It was the script and blah acting (except for Cranston) that was the problem. I think he could do a decent job on a Star Wars flick with a good script. So is Pumaman no longer posting his reviews here? And if anyone gets the Pumaman reference, good for you! He probably got tiredof evedyone always bashing him. I don't blame him from leaving. I never usually agreed with his reviews, but at least when he posted a review, I was then able to post my own. Selfish of me, I know, but I like getting review out, even if I'm the only one that's going to read it. I always read Putman's review, and usually disagreed with 85% of them, but he did a good job writing them. Too bad he was full of sh*t in most of his reviews--no offense. So, it's ok to call Alex with names but it's not ok if you insult D. Putman or Mink. Oh, and I agree with cress, well said mate. Just as long as i take it,eh? Director ditches antman over creative differences. I think this could end up dooming it. Its been all this guy so far championing the idea and now hes gone. Maybe marvel finally got smart and did some focus tests and found out nobody gives a sh*t about antman and that they were gonna lose a TON of money on it and started asking for a bunch of changes to make it more mainstream friendly. Another retard who let Star Wars become his guiding choice in life.